Have you ever been in a situation where you were absolutely in the right, but were unable to convince someone else who had a differing viewpoint? When you are right, and someone else is wrong, especially about basic facts (e.g. when water is frozen it becomes ice), it can be frustrating to say the least. When I’m in the middle of an argument I can feel the infuriation rise the more I try to convince the other person of my side. The other day when I was attempting to explain how to read a piece of sheet music to my friend, who disagreed with my interpretation, it became clear to me that the more I tried to convince him of my understanding, the more frustrated I became. In the midst of the argument I asked myself, “why?” When it isn’t a matter of life or death, is convincing another of your “rightness” really worth it? The need to be right, even when you are, can erode relationships and prevent us from seeing each other as the complex, mysterious human beings we truly are. 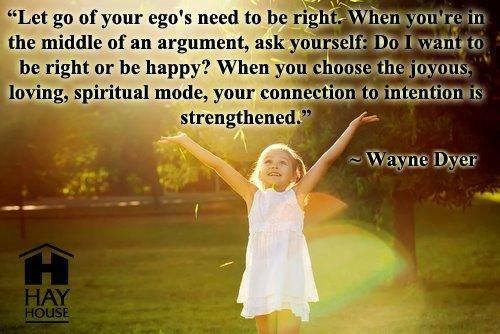 The need to be right is also the perfect doorway for the ego to take over your life. Identifying with a mental position and fighting for the life of that position is ego. Next time an argument starts to go off the rails, take back control from the ego by letting go of the need to convince another person of your position. But be careful that the ego doesn’t sneak back in through judgment of the other person based upon their thoughts. When I let go of a mental position and feel satisfied because I am the “bigger person” I have let the ego take control in the most opportune moment for its demise. On the other side of identification with thought is true communication, greater understanding, and better relationships. Thank you so much Gede Prama, your compassion and encouragement are food for my soul! It is my honor that we are connected. Love, Katie.